Contractors and other authorized parties (claimants) use construction liens to protect their interests while improving someone else's property. 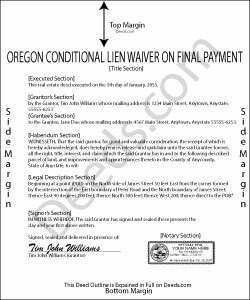 To encourage payment, the contractor may offer to waive lien rights. For example, let's say a customer pays the total balance due. After the payment clears the bank, the claimant completes and records a conditional waiver on final payment form, which identifies the parties, the nature of improvement, the property, and the relevant dates and payments applied. By recording, the claimant releases all rights reserved by the earlier lien.